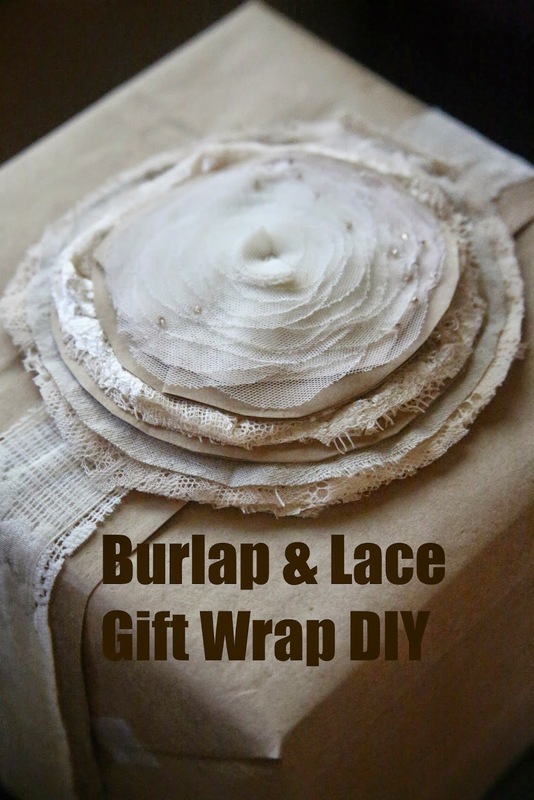 I thought I'd share with y'all this morning a little DIY tip for a fun gift-wrap project. One of my favorite things to try to do is to THINK OUTSIDE OF THE BOX. Don't think of things the way you've always seen them done. Instead, take unique ingredients you may have on hand + brainstorm! 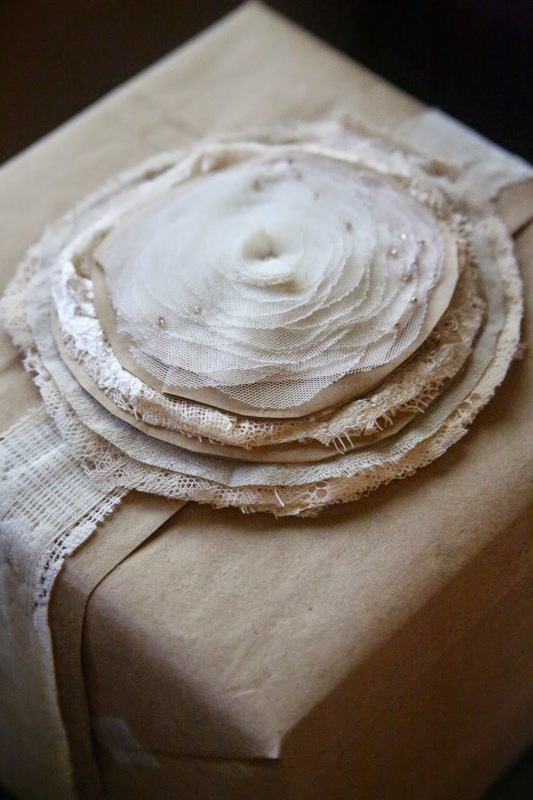 Following that, I cut out lots and lots of different size circles using more of the paper bag, the sleeve of the lace shirt, and burlap scraps. I put my tee shirt flower on top, super glued the whole deal together, and tada! There you have it. How about you? Do you have any unique ideas for fun gift-wrapping? Leave a comment! And speaking of comments...thanks for all the sweet comments on the Vlog yesterday. Thanks for the idea, Chels!! you're such a genius, and you already know I love this. :) recently I was at a shower and one person had a larger gift and bought one of those 99 cent plastic colored tablecloths, and wrapped it all around and tied in a bow! super cool. I love how you wrapped your gift! The bow is so beautiful and yet so unique and different! One way my mom likes to wrap gifts is with old road maps! :-) It's pretty fun, especially if you're traveling and want to give a gift to somebody on your trip, and you have it wrapped with road maps from their state! There are so many cool ideas out there! Just left a comment for you on your family's blog thinking it was this one...you and your family are in my prayers, Chelsy. Hi Chelsy, My name is Rebecca, and I have signed up to receive your blogs via email. However, I haven't been receiving them, and my email provider told me I needed to add your email address to a safelist. Would you mind sharing your blog's email address with me so that I can add it to the safelist? Thanks! Praying for you and your family Chels!! I feel so awful for posting about my email troubles. Chels, I had no idea. I'm SO sorry. Prayers for you and your family. 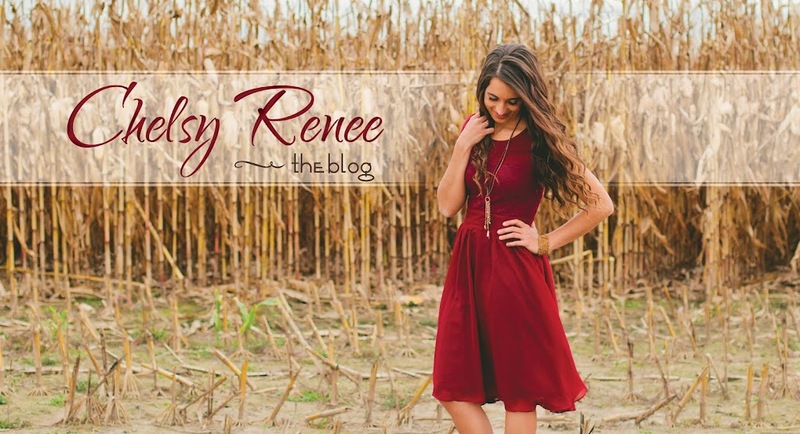 Love the vintage style of this, Chelsy! 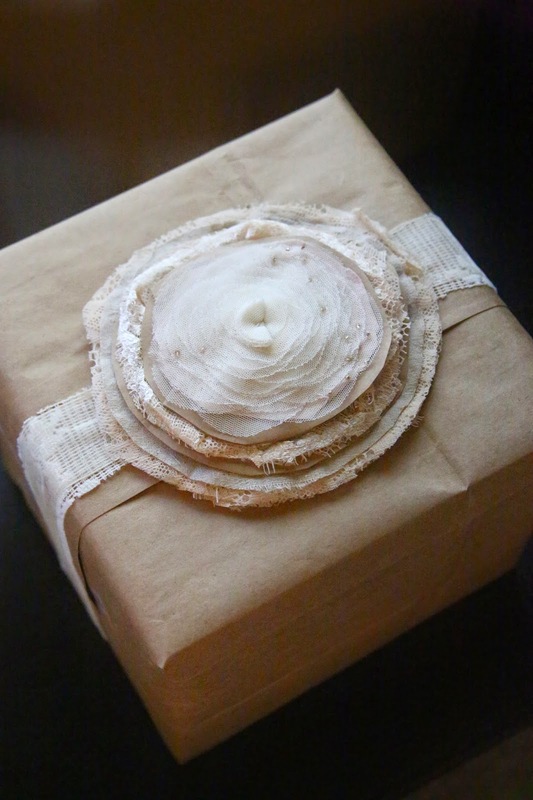 Brown kraft paper (or a style with white dots on it), yarn/string/lace, and washi tape are a handful of my favorite supplies for packages. Love the fabric flower idea, too!